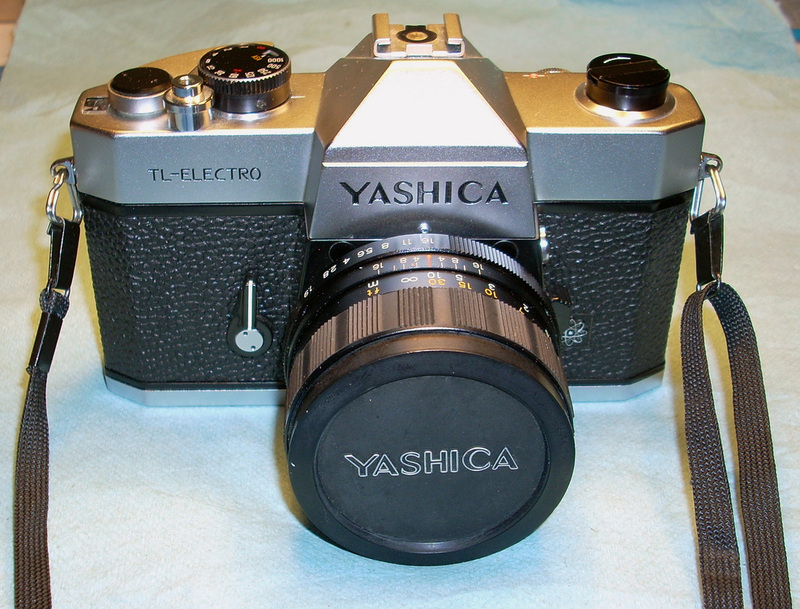 The TL Electro was my first 35mm camera purchased back around 1974. I can't remember for sure, but it probably came from K-Mart or a similar discount store. I enjoyed this camera for many years before selling it when I upgraded to a new Canon AE-1. I regretted selling it as I was always fond of that first camera. Well, I was surfing eBay one day and guess what I found: a TL Electro with 3 lenses described as "guaranteed in excellent working order" and all for $30 bucks plus shipping. What could possibly go wrong with a deal like that? The camera is fairly clean with no serious scratches or damage. Someone has taken good care of it. But as soon as I wound the film lever and pressed the shutter I knew something didn't sound right. So much for "excellent working condition". Removing the lens revealed the mirror was stuck in the up position. Another clue something was amiss was the shutter speed dial was a bit hard to turn. 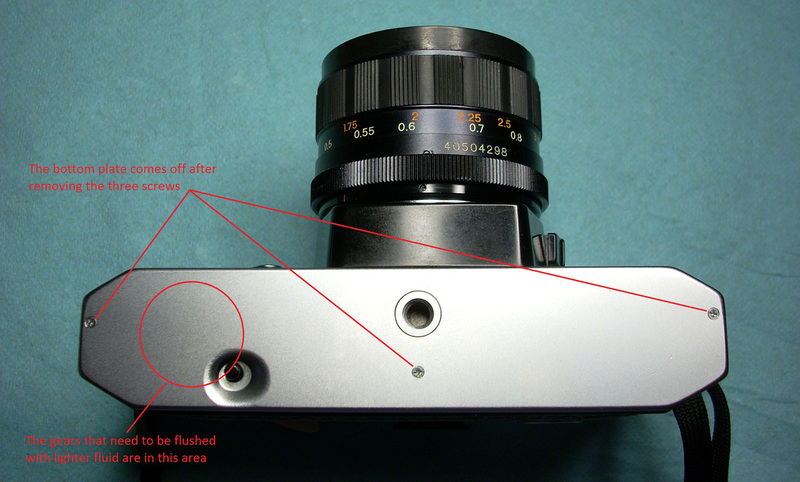 A little research online revealed the stuck mirror is a very common problem with these vintage cameras. Another common problem is that all the foam gaskets deteriorate and turn to goo. On this camera what's left of the gaskets need replaced and the mechanics need cleaned to get the camera working again, but fortunately in the case of a TL Electro, it's not too hard a task. To fix the stuck mirror the bottom cover needs to come off. 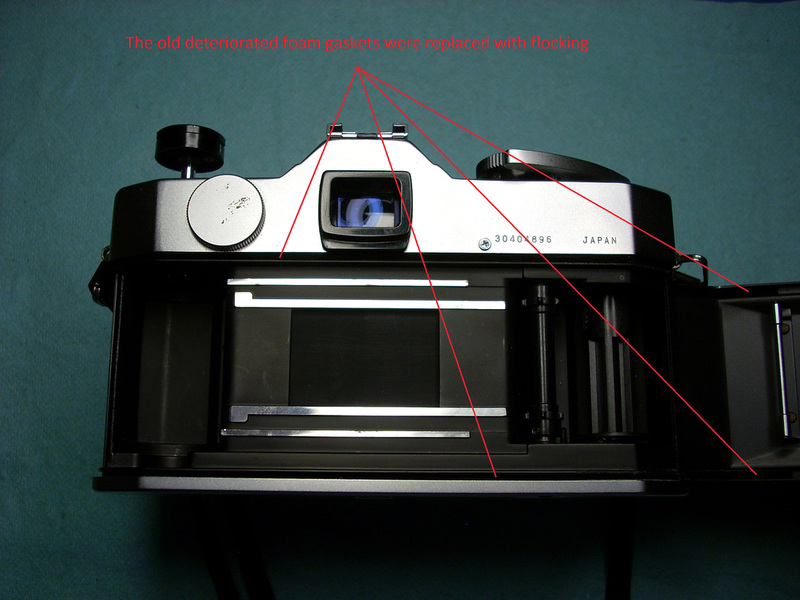 The quick fix, according to the APUG vintage camera forum, is to drip lighter fluid into the mechanism to clean the gears. 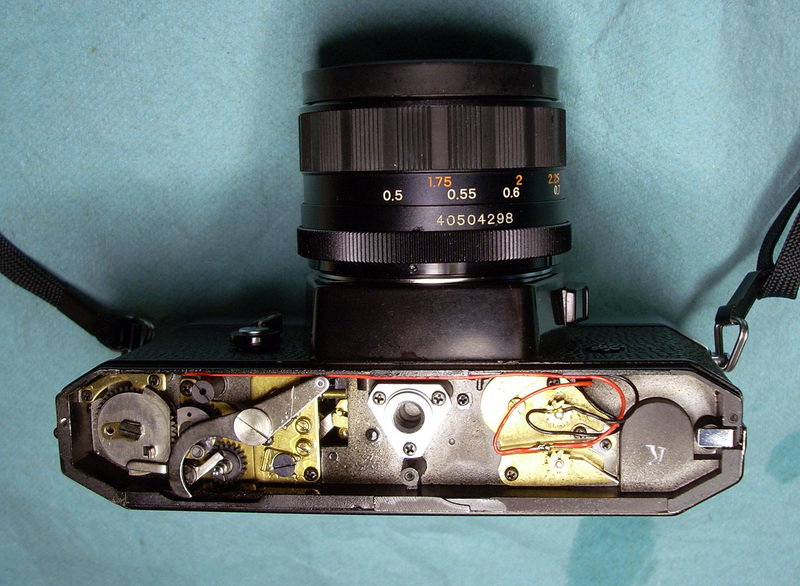 The idea is to drip fluid into the mechanism and then turn the camera right side up so the fluid can run back out, bringing the dirt and crud with it. After I did this 3 or 4 times the mirror worked again. And the shutter dial now turns easily. The big caveat is not to let the fluid run down in the center of the camera or it will get into the prism area and then the top will have to come off to clean up the mess. I also noticed lighter fluid got onto the shutter curtain, which alarmed me at first. But after leaving the back open a while the fluid evaporated from the curtain and it doesn't appear any harm was done. I suspect this lighter fluid trick is not a permanent fix and at some point I might have to pull the top off the camera to clean and lube the mechanism properly. But at least this lets me know the camera is functional and I can use it for now. 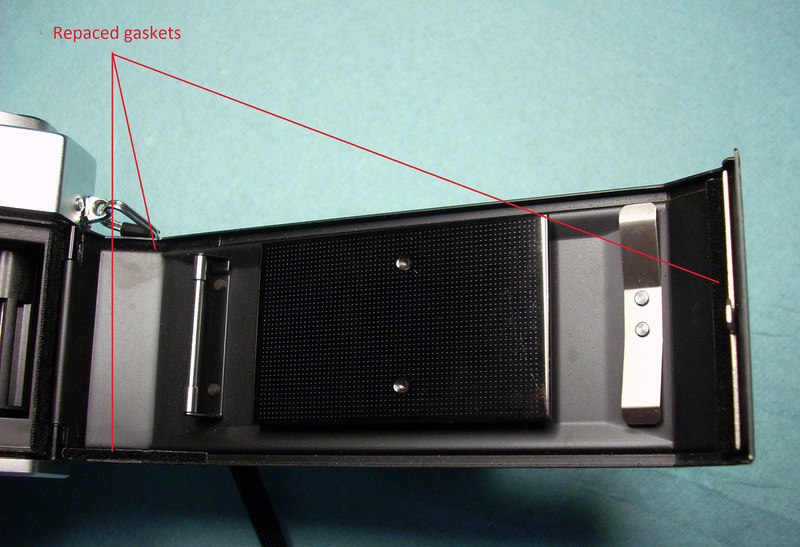 At left is another photo of the bottom with the cover removed to reveal the mechanics on the left side. When the mirror flips up out of the light path it hits against foam padding surrounding the focusing screen. This foam had deteriorated just like the seals and had to be replaced. 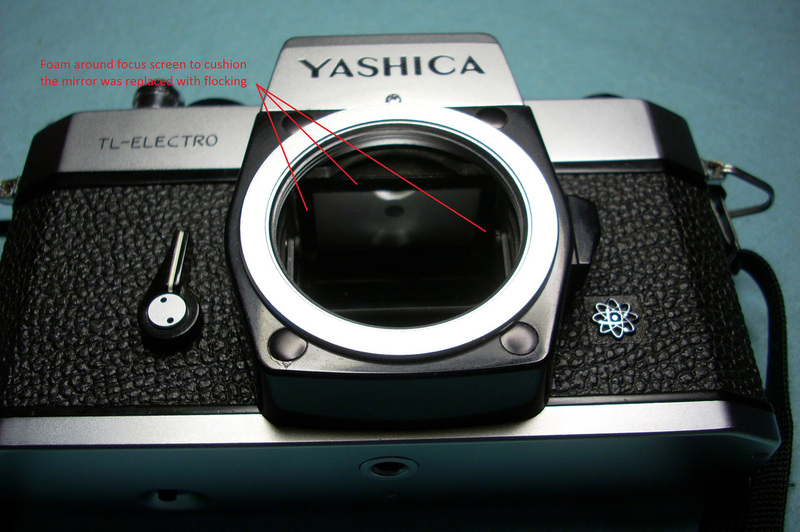 I love Yashica's little atomic logo. All the old foam crud that hadn't already fallen out was scraped out of the light seal grooves and new seals installed. The online sites recommended self adhesive foam but I used leftover flocking from lining my telescope because I already had it on hand. The only marks on the camera are on the battery cover. I found another damaged TL Electro online for $8 bucks that has a good battery cover and as a bonus the little plastic cover for the hot shoe. So I ordered it for the parts and to practice removing the top of the camera so I can properly clean the mechanics. There's another light seal along the end of the door. The camera now functions properly and hopefully I've taken care of all the seals so there won't be any light leaks. The only issue left to resolve is replacement batteries for the meter circuit. The camera's meter circuit uses two 1.35 volt mercury batteries that are no longer available. Supposedly two modern alkaline button cells (LR-44/AG-13) can be used with an adapter, but they have a higher voltage (1.5 volts) than the originals. And the alkaline batteries don't have a stable output voltage over their lifespan like the mercury batteries did, which could cause inaccurate meter readings as the batteries drain. For testing I made a battery holder in which I installed two 1.5-volt AG13 batteries with a diode in series. The forward biased diode dropped just enough battery voltage to bring the output down to the required 2.7 volts. The diode came out of a parts bin and is unmarked so I'm not exactly sure what type it is. I don't know just yet if this will be my permanent battery solution.